Well-known for its revolutionary circular saws, the SKIL is one of America’s leading manufacturers of portable power tools. They’re producing items such as belt sanders, screwdrivers, measuring instruments, mixers jig saws, sealant guns, angle grinders, and many other kinds of tools. Among them are hammer drills too, and of them is the SKIL 6445-04. This model comes with a powerful 7.0 motor that allows tough applications, a 1/2″ keyed chuck that accepts large diameter bits, a side handle for the more accurate drilling, and a variable-speed trigger that enables one to control the speed of the drilling process. And the best thing is that all of this comes at a genuinely reasonable price! Affordable and packed with features, the SKIL 6445-04 certainly deserves a more in-depth look. Let’s analyze the characteristics of this hammer drill and find out if it’s worth considering for purchase! 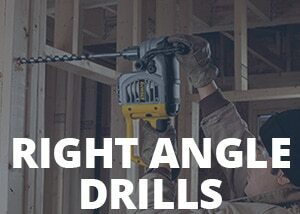 Like we said, this hammer drill is driven by the standard 7.0 AMP motor, which is supplied by the 120-volt wall power and turns the 1/2″ chuck. Almost all hammer drills in this price category feature 6-8 AMP motors, so SKIL 6445-04 falls right in the middle and is more than suitable for most applications. The model sports a removable grip (can be used by left-handed users) with an adjustable depth gauge, a variable speed trigger for applying exact amounts of power, and the hammering mode for drilling through masonry. The fact that it’s a wall-powered drill removes the frustrations that come with batteries and battery chargers. One of the most essential characteristics of this model is its low weight of just 5.5 pounds. As you can already guess, that makes the tool much more manageable during the drilling operation, and much more convenient to carry around on your belt. As far as we’re concerned, the portability is extremely important when it comes to drills and should be a feature of every handheld tool. The SKIL 6445-04 checks the box and minimizes the user fatigue. Furthermore, the model also has a well-positioned side handle whose purpose is to provide the user with suitable control over the unit. It is reversible and can be used by the left-handed users, but can also be rotated for 360 degrees and thus give you the best possible ergonomics for the precise drilling. The heart of this hammer drill is its 7.0 AMP motor, capable of achieving 3,000 RPM and 51,000 BPM. It’s the power source of both the machine itself and all the extended attachments, so you won’t have to provide an additional power source for the peripheral components. The motor is powerful enough for a myriad of drilling operations and is sufficient enough to deal with tough applications. It turns the unit’s 1/2″ key lock chuck system, which plays a critical role in suitably accepting the bits with large diameters. It easily creates room for working with both masonry and wood, making the device the only thing you’ll need for all of your drilling demands. We should also mention the variable speed triggering system, which lets the user regulate the speed according to the task at hand. It works just as advertised and it’s yet another plus for SKIL 6445-04. Even though it comes at a low cost, the SKIL 6445-04 definitely had us impressed with its useful features. Even though it can’t really be compared with motors found in premium hammer drills, the engine of this unit is still powerful enough to help you with simple masonry-related tasks. The fact that it can achieve 3,000 RMP and 51,000 BPM was pretty surprising to us – we certainly didn’t expect that from such a cheap model. We also have to give some special praise to the unit’s side handle. Not only can it be rotated 360-degrees, but it can also be reversed if you’re a left-handed user. The same can be said for the presence of the variable speed trigger, which allows more precise drilling and lets the user do his work more accurately. When it comes to downsides of this device, the biggest one is that it’s not suitable for the really heavy-duty tasks. The reason behind that is that it tends to overheat in such situations, so try to avoid heavier use if you don’t want to experience breakage and motor failures. Don’t forget that this is a corded drill – it removes the problems that come with batteries but also restricts your movement. You’ll be limited by the length of the included cord. The overall consumer reviews for this drill are mostly positive, and the model has a pretty good rating, which is a good indicator of how well it was received. The users are praising the unit’s combination of a reasonable price and useful features, saying that it has excellent value for the money. They’re saying that the SKIL 6445-04 is sufficiently robust for a plethora of DIY projects, from anchoring wood to the floor to installing curtain tracks to the ceiling. The users agree that the model is more than suitable for the general household use. In our opinion, this budget-priced model still provides plenty of power for us to consider it a valuable purchase. Milwaukee and DeWalt drills may offer more quality, but you’ll also have to pay a lot more money for them. The SKIL 6445-04, on the other hand, is sufficient enough for the most household applications and comes at a much lower cost, so we can’t do anything else but give it our recommendation.